Just in time for the holiday shopping craze, PETA has launched a website that takes the guesswork out of buying cruelty-free gifts. How to Wear Vegan has all the information you need to pick and choose the best gifts, from nonleather handbags to vegan Stella McCartney pieces. Debuting this Cyber Monday, the How to Wear Vegan site compares and contrasts the best vegan wares for any budget. Hunting down the best fashionable vegan finds is a full time job in itself. 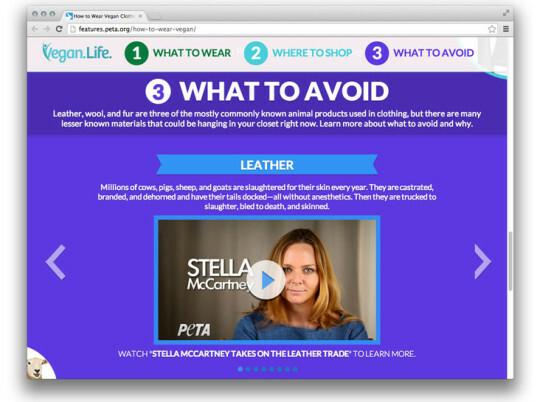 PETA’s new site is a total shopper’s guide to living sustainably, while looking amazing. Made to making buying cruelty-free clothing and accessories as easy as pie, How to Wear Vegan is a how-to guide for finding the very best pleather, faux-silk, moc-croc and fur-free sweaters and coats. Each of the featured items is investigated, checked and guaranteed to be fashionably vegan. The new site won’t just feature vegan retailers, but also differentiate vegan items offered up by mainstream shops like Gap, Forever 21, Target and H&M, as well as high end designers like Stella McCartney. Aside from beautiful finds for the whole family, How to Wear Vegan also gives a guide on materials to avoid. An easy to read infographic describes why materials like wool, silk, angora, shearling, alpaca, snakeskin, mohair and down should be avoided, how they are manufactured and where they are sourced from. This holiday season let PETA help you be an even more fashionable vegan. 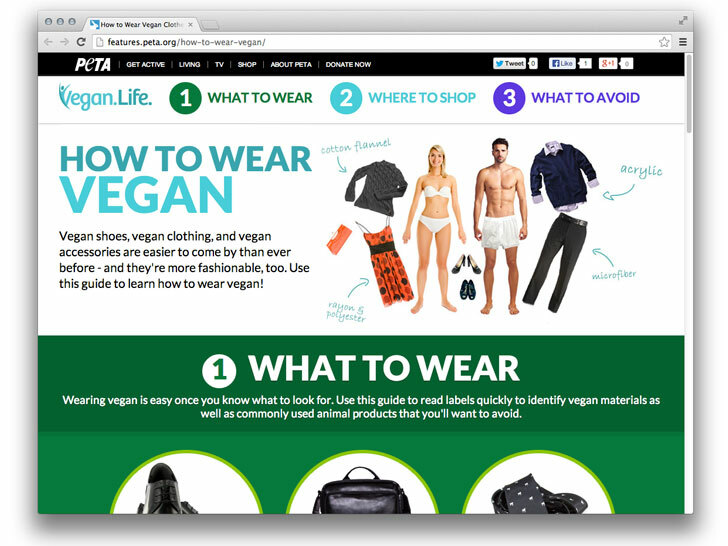 PETA's Cruelty-Free Shopping Guide Shows You "How to Wear Vegan"